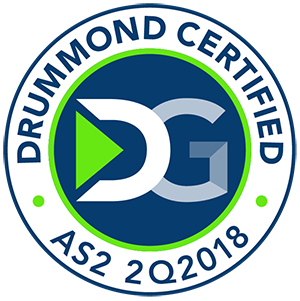 As a Drummond Certified™ AS2 software solution, GoAnywhere MFT has the features you need to simplify your AS2 protocol transfers with your trading partners. AS2 (Applicability Statement 2) is a popular protocol specification for transporting critical data securely and reliably over the internet. Advantages of using AS2 protocol include end-to-end encryption, strong authentication of senders and recipients through the use of digital signatures, and validation of file integrity with successful transfer confirmation. GoAnywhere MFT contains AS2 client software that provides users with AS2 server capabilities in a simple, secure, and scalable solution. GoAnywhere MFT works on nearly every platform including Windows, Linux, UNIX, VMware, and IBM i.
GoAnywhere MFT is Drummond Certified for Applicability Statement 2, which helps to ensure successful integration with your AS2 trading partners. The Drummond certification process uses full matrix interoperability testing between AS2 vendor solutions to verify important transactions maintain their security and integrity as they are transmitted over the Internet. In order to pass the Drummond Certification process, GoAnywhere MFT had to conduct thousands of AS2 protocol test scenarios successfully. This certification provides customers with peace-of-mind that GoAnywhere can handle their most critical AS2 documents. The AS2 client software in GoAnywhere MFT can automatically send AS2 messages on a scheduled basis. Multiple files can be sent with each message. If a connection breaks, GoAnywhere can automatically reconnect to the server and retransmit the message. Both synchronous and asynchronous receipts can be automatically logged in GoAnywhere to ensure AS2 messages were successfully processed by the trading partners. The AS2 server in GoAnywhere MFT allows you to receive AS2 messages from your trading partners easily. Trading partners can be authenticated using a combination of user credentials and X.509 certificates. When a message is received, you can have a trigger automatically process the received files. For instance, GoAnywhere could move the AS2 documents to another area on the network or call an application to process these files. 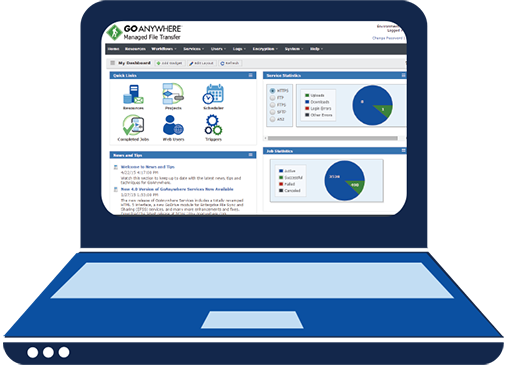 GoAnywhere MFT provides a browser-based interface for configuring and monitoring AS2 protocol file transfers and workflows. Each administrator can be assigned different permissions in GoAnywhere with their own custom dashboards. "We were able to get an automated system up and running quickly, which can be easily adjusted for any schedule changes. The customer service at [GoAnywhere] has also been wonderful. I would definitely recommend GoAnywhere and Linoma's [now HelpSystems] support staff to anyone."